I had originally planned to upload a few other images, but instead my special USB decided to break and entirely ruin that novel idea! Yes, break as in port. stick. in shambles ... how lovely! And, between the countless whispers of, "well, you did back everything up," from what seemed to be everyone in sight, and a brief sobbing session, needless to say it did not matter at that point! Sure, I had loads of things backed up, however the files that I really wanted were on said USB. Just before the switchover the wires were in tatters. Yes, it was one of those days! But, the day wasn't complete crap, after a good calm down I managed to have a worthy IT guy take a look at it and he miraculously collected what he could from it. Watching him in action was quite like a present day episode of MacGyver, and obviously a very hi-tech version. The same feeling you get when you think you've lost your handbag or wallet ... you know, that deep belly of heaviness and stomach dropping sensation, sprinkled with high increased heart beats—that's how this felt. Since the only thing I could think of afterward involved a shot of something, I decided to pair that concept with a few fashion items that I've been loving at the moment. I imagine normal programming will resume shortly, but until then enjoy these inspiring gulps of style. 1. A refreshing basil and mint mojito and Baublebar mint cuff bracelet, 2. Mandy Flats with tassels-Madison Harding and Cranberry Mojitos, 3. Dalmore 18 year old single malt scotch whisky and vintage-inspired drop-waist dress-ASOS, 4. Chained on Love bag-Urbanog and a White Russian. Alternative Probiotics recipe here. Inside and Outside BlogP.S. I'm hosting an international 2 friendship bracelets giveaway on my blog here check it out! Hi dear, sorry to hear about your USB data drama, I have lost much important information too that way before. Love the ladylike rusted orange dress, so pretty! Sorry for your tech troubles, darling! Love this collage ~ so fun and creative! defo!!! understand how you feel about this, so sorry about the loss of data, beautiful picture dear. Aw Madison, I'm sorry to hear about your USB :-(. I've been there before, except I didn't have an IT guy to help me save even a little bit. Nonetheless, this post is so cute! I love the mint bangle and snakeskin loafers! Oh wow, that sounds horrible, hope you're alright now. Thanks for visiting. So sorry to hear what happened:( I think we all know (and been there) what you're talking about. Gad your IT guy was able to salvage some stuff. So sorry about your USB. I don't have all my stuff backed up so the thought of this is already freaking me out. I love the mint mojito and mint cuff and the white Russian. I know that feeling all too well! The situation where a mojito or whisky could act as a remedy. the dress is perfect. would love one like that. Oh sorry for your tech and USB issue. Lovely collection of items dear! oh, interesting, I back things up on another hard drive but this was right before the saving moment! *Definitely back up everything lady! Thank God someone was able to recover the info! I freak out when stuff like that happens. I love the Baublebar bracelet and the bag. I've been obsessed with mint green lately. Oh, I know just how you feel, Madison - once, years ago, right at the end of university term, my brother and his friends downloaded a program that wiped our computer hard drive... which meant all of my end of term essays were lost! I was devastated. A miraculous IT guy managed to get most everything back, but the initial shock was pretty awful. You managed to get a lovely post together in spite of your set back - I just love that orange dress! Yes, Thank you Jen. I love the cuff too. Mint is just a pretty colour! I absolutely love this idea!!! those shoes are simply gorgeous. Sorry about the loss of data. LOVE it all! 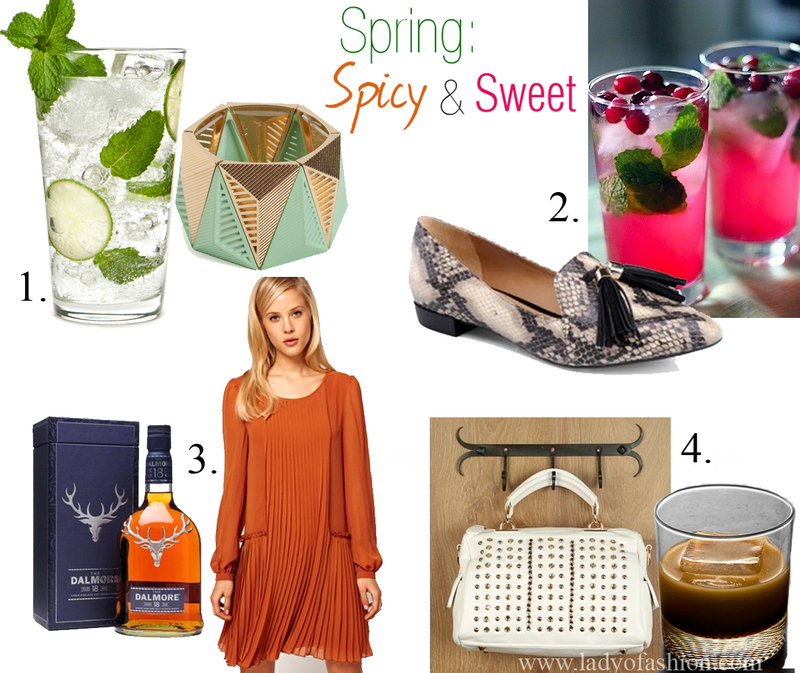 Especially the cuff, and my husband would love that scotch! Ugghhh.... technology!!! How it has us completely dependent on it! Fortunately, from the ashes has come this lovely inspiring post! 1 & 2 are speaking my language!!!! Yes, backup everything, haha. I do that and it still happened, but better times are ahead. Thanks. Yes, I could have used that mojito as well at that moment, lol. Thanks for your comment.